1. Preheat the oven to 200˚C, gas mark 6. Toss the cauliflower florets with the oil, season and spread out on a large baking tray. Roast for 30 minutes, turning halfway, until browned and tender. Reduce the oven to 190˚C, gas mark 5. 2. Meanwhile, put the milk in a small pan and heat gently until just steaming, but not boiling. Melt the butter in a second, larger pan set over a low-medium heat. Stir in the flour and cook for 1-2 minutes, stirring constantly. Swap to a balloon whisk and gradually add the hot milk, whisking gently to create a smooth sauce. Gradually add the lager and bring to the boil. Simmer gently for 6-7 minutes, stirring, until very thick. Season and remove from the heat. Immediately stir in the mustard, worcestershire sauce, crème fraîche and ½ the gruyère. Cover and set aside. 3. Butter a medium-sized ovenproof dish. 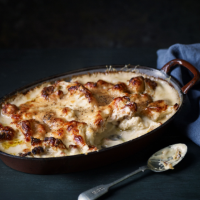 Pile in the roast cauliflower and spoon over the cheese sauce. Scatter with the parmesan and the remaining 75g gruyère. Bake for 30-35 minutes, until golden and bubbling. Rest for 5-10 minutes before serving with salad and/or baked potatoes, if liked. It’s important to add the hot milk to the flour and butter very slowly to start with. Once you have a smooth mixture, you can add it more quickly.